Different people have defined sustainable agriculture or food production in different ways. In general, sustainable food production refers to the farming systems that maintain productivity indefinitely through ecologically balanced, environmentally safe, socially acceptable, and economically viable practices. It is a system that ensures food security for the growing population of the world by taking science, economics, human and environmental health, and social aspects into consideration. Agriculture has evolved over thousands of years from subsistence farming meeting the needs of individual families to agribusiness catering to the needs of consumers around the world. Arthropod pests, diseases, and weeds (hereafter referred to as pests) have been an issue all along, but their management went through cyclical changes. Pest management initially started by using naturally available materials such as sulfur or plant-based pyrethrums that gradually evolved into using toxic natural or synthetic compounds. While pesticide use improved farm productivity and food affordability, indiscriminate use of synthetic broad-spectrum pesticides in the mid-1900s led to serious environmental and human health issues. 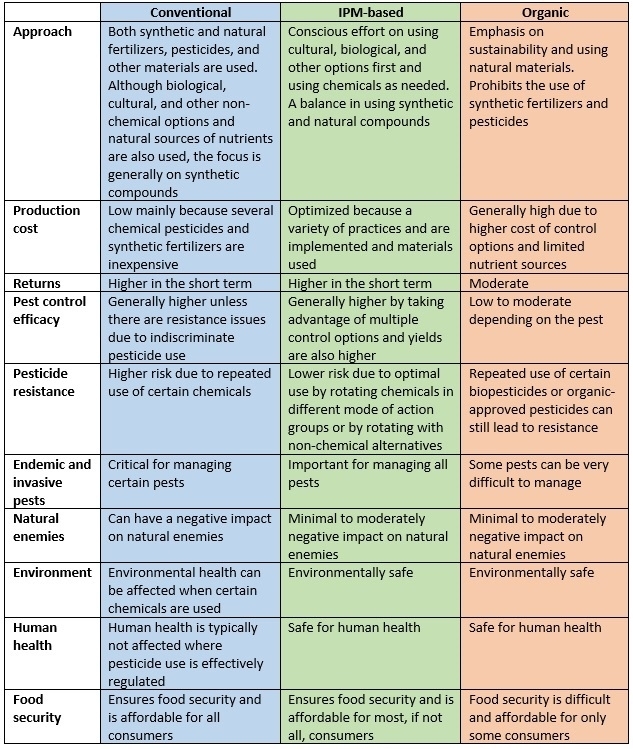 Pesticide use regulations, the discovery of safer pesticides, and new non-chemical alternatives, in the past few decades, have improved pest management practices to some extent. Newer pesticides are also relatively less toxic to the environment. However, large quantities of synthetic chemical pesticides are still used in conventional farms along with other control options for managing a variety of pests to prevent yield losses and optimize returns. Lack of good agricultural practices or IPM awareness has also contributed to the excessive use of chemicals and the associated risk of resistance in pests and environmental contamination in some areas. For example, in some developing countries, or countries where pesticide use is not strictly regulated, highly toxic pesticides are used very close to the harvest date, causing serious health risks for consumers. Under these circumstances, in recent years, consumer preference for chemical-free food gave impetus for organic production; thus, the acreage of organically produced fruits, vegetables, and nuts has been gradually increasing. Many stores now promote and sell fresh or processed organic foods, at premium prices, to those who can afford them. While organic farming is generally considered more challenging and less productive, growers are willing to take the risk as they try to meet the market demand and produce organically. However, managing weeds in organic farms continues to be a labor-intensive and expensive part of production. The labor shortage in many areas exacerbates manual weed control. In some crop and pest situations, control of pests with organically acceptable tools is not sufficient. Unmanaged pest populations can spread to other areas and/or crops, cause higher yield losses, and indirectly contribute to higher pesticide use on neighboring conventional farms. On the other hand, IPM offers an effective, practical, and sustainable solution where excessive use of chemical pesticides is limited, pest populations are effectively managed, and returns are optimized without having a negative impact on the environment. 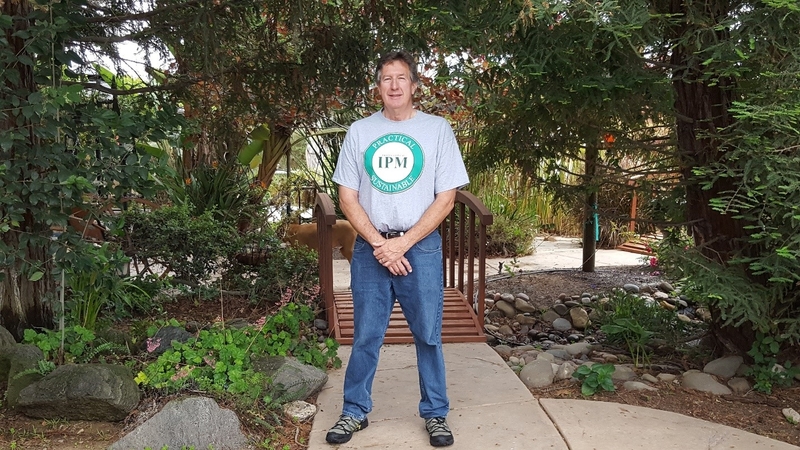 IPM is an approach where host plant resistance (selection of resistant cultivars), modification of planting dates, crop density, irrigation and nutrient management or use of trap crops (cultural control), conservation or augmentation of natural enemies (biological control), pheromones for mating disruption or to attract and kill (behavioral control), traps, netting, and vacuums (mechanical control), chemicals from various mode of action groups (chemical control), plant extracts (botanical control), and entomopathogens or their derivatives (microbial control) are used in a balanced manner. It is a comprehensive approach where all available strategies are considered to achieve pest control with minimal impact on the ecosystem. However, many consumers are not aware of the difference between organic and conventional practices or IPM strategies. Many perceive organic farming as a pesticide-free production system and as the only alternative to conventional farming with synthetic chemicals and nutrients. Organic farming also uses pesticides, fertilizers, and hormones of natural origin. For example, potassium salts of fatty acids are used against insects, mites, and fungal diseases. Mined sulfur is used as a miticide and fungicide. Popular organic insecticides, based on pyrethrins extracted from Chrysanthemum cinerariaefolium flowers, are very toxic to natural enemies, honey bees, and fish although they are less stable in the environment than synthetic pyrethroids. The bacterium, Bacillus thuringiensis, which is the source of the toxic insecticidal protein in genetically modified corn, cotton, soybean, and other crops, is widely used in organic farming for managing lepidopteran pests. Organic produce is also perceived to be healthier than conventional produce although several studies showed that there was no such difference. A thorough understanding of conventional, organic, and IPM-based production could influence consumers' preference and allows them to make informed, practical, and science-based decisions. 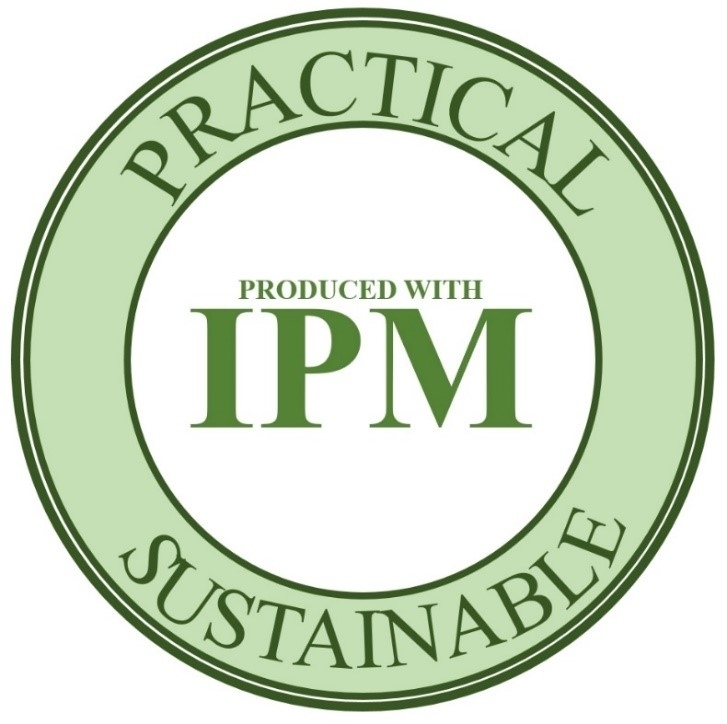 IPM encourages the use of all available control options in a manner that maintains productivity without compromising environmental and human safety. IPM-based food production can be a better alternative than organic production for various reasons (Table 1). 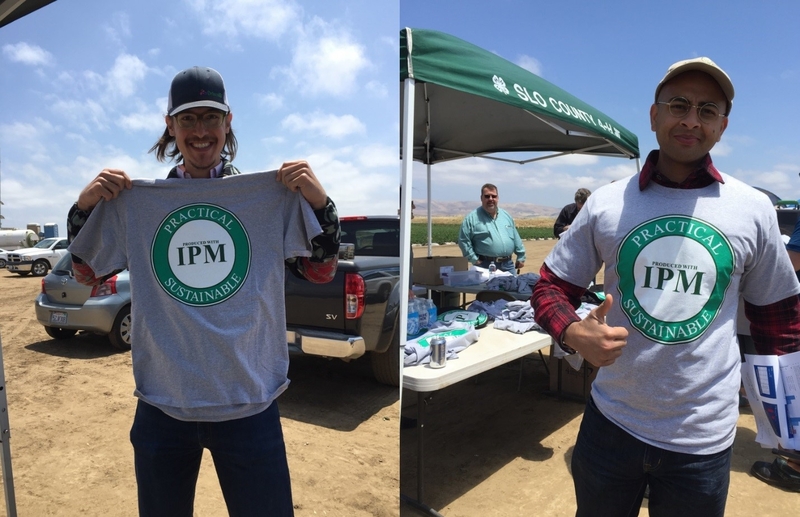 While several growers already adopt IPM practices, an IPM label or seal can authenticate the production system. Since pest control efficacy, productivity, and operational costs are optimized for affordable food production without compromising health aspects, an IPM-based/branded food production system, which utilizes both modern and traditional technologies, might offer a better alternative to the organic system. IPM-based production allows the use of chemical pesticides to address critical pest issues when needed, without losing the focus on environmental safety and sustainability. Agriculture is a global enterprise and California agriculture leads and influences farming practices around the world. While food production with an organic seal can continue, shifting to production with an IPM seal might be a practical and sustainable approach.